The largest Global Female Startup Competition is coming. Hosted by Lean In Shenzhen, SHE LOVES TECH Greater Bay Area 2018 Global Startup Competition has STARTED! Are you Ready? Led by She Loves Tech, a global initiative aiming to showcase the convergence in the latest trends in technology, entrepreneurship, innovation and the opportunities it creates for women, the competition is expected to attract over 500 women impact and women-led startups from around the world, where they will benefit from an interconnected global network of like-minded innovators, mentors, investors and other supporting organizations. 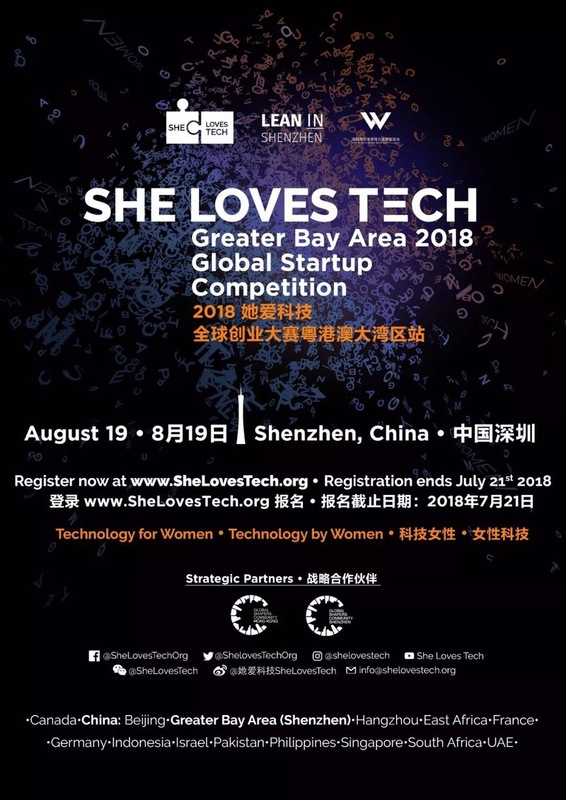 The She Loves Tech 2018 Global Startup Competition will be held in 14 "One Belt One Road" locations across Canada, China, France, Germany, Indonesia, Israel, Kenya, Pakistan, Phillippines, Singapore, South Africa and the UAE. With local rounds held from June to August, local round winners will finally meet in Beijing, China for the global finals happening at the International Conference on September 15, 2018. Last year, only two stations - Beijing and Hong Kong - were set up in China, and nearly 20 teams were involved in the competition. This year, they increased major sub-stations, with Hanzhou and Shenzhen included as well. As a new branch of 2018, Shenzhen has been equipped with high-tech to radiate the whole of Southern China, and the Lean in Shenzhen team has successfully invited the organization team of the Hong Kong station of 2017 to cooperate fully to run "the Greater Bay Area 2018 Global Startup Competition". We will keep the enthusiasm to welcome startups who support women and show the beauty of science and technology. We believe to set the fire of entrepreneurship to brighten the life of women, science and technology. The She Loves Tech 2018 Global Startup Competition will be held in 14 "One Belt One Road" locations. Within 500+ Tech startups, the competition is blooming in 12 countries. b. At least one female entrepreneur must be part of the founding team who is using technology to solve a problem. After registration checking, the venue and process of the Greater Bay Area sub station will be informed in the form of invitation letters. If you have any questions about the competition or the way of registration, please scan the QR Code to add our assistant to help you.